Within you beats a wild and compassionate heart, alive with fierce optimism. You have the courage to walk a path of transformation. You will not be tamed by convention. You are not afraid to be different, to take risks for what you love, and most of all, to keep hope in your heart. You are one of the wild ones. This deck is for you. 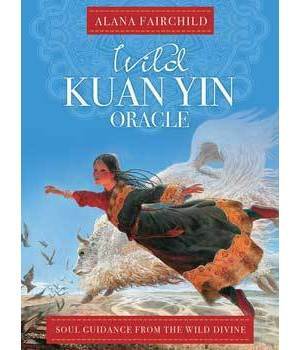 'Wild Kuan Yin Oracle' will be your light in those moments when the darkness seems too much. When the loving peace of Spirit seems too far away from the troubles of the physical world, this oracle deck channels the energy of the Divine Mother to bring you comfort. She'll remind you of your fire, your boldness, your unique beauty, your passion, your courage. She'll guide you through even the darkest trials into the blessing of new life. She'll open your heart and mind to untold possibilities and assist you to live your highest destiny with fearlessness and joy.